In the wild, Senegals are considered a pest for farmers, eating agricultural product such as millet and maize but in captivity this is among a family of birds known for making excellent pets. 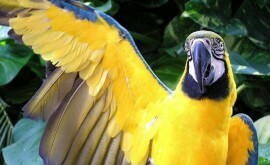 The Senegal is also much quieter than other parrot species and it has a temperament often described as “calm”. While size can vary, on average the Senegal bird measures nine inches long. For coloring, the body is primarily a dark green coupled with a throat of iridescent green, thighs of orange, and a chest of bright yellow. The Senegal also has black feet and beak and yellow-orange eyes that pop against the dark gray face. The Senegal is a natural breeder across many parts of West Africa. Based on availability of seeds, blossoms, fruit, and other foods that make up the bird’s diet, it migrates to different regions. In its natural habitat, the Senegal lives in the savanna and in open woodlands. 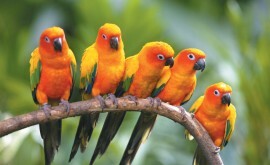 Within different countries of West Africa, this parrot flocks with other birds of the same species. On average, this parrot lives between 25 to 30 years in the wild but in captivity, there are reports of the Senegal living up to 50 years of age. In general, the Senegal enjoys being around people. As with most parrots, this species is typically attracted to one or only a few humans. For entertainment, this parrot does not necessarily need the presence of another bird but it does appreciate human attention. Because of this, daily interaction is highly recommended. For someone with intermediate knowledge of parrots, the Senegal is an excellent choice. Although loving and calm, this species can become agitated when not getting its way or not being provided enough attention. Therefore, the Senegal is not recommended for children or novice bird owners. In a natural environment, the Senegal will nest in holes found in trees, usually oil palms. For reproduction, this bird usually lays upwards of four eggs, which are incubated by the female once the second egg is laid. After about 28 days, hatchlings are born with very little white down. After being born, it takes about two to three weeks for the eyes to open. Food and warmth is provided by the female who stays in the next until the hatchling reaches approximately four weeks old. Around nine weeks, the hatchling will leave the next and become completely independent by about 12 weeks. Breeding a Senegal in captivity is relatively easy and typically begins between three and four years of age although sometimes birds take up to five years. 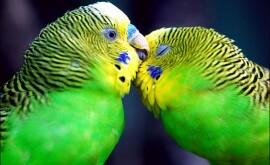 The one exception is with parent reared parrots in which case breeding can occur as early as two. In order to breed a Senegal, a nest box is required. For this, it is important to choose a box large enough to accommodate the bird’s size and it should have both an entrance and exit port. Among the different species of parrots, the Senegal is actually one of the quietest although it is known for chattering with an interesting range of squawking and whistling. In addition, this particular species can learn to talk although vocabulary is usually not more than 10 words or so. One of the greatest benefits regarding speech and sound is that the Senegal is not a screamer. It is important to provide a Senegal with a nice selection of brightly-colored toys. While this species is on the smaller size, it has a beak large and strong enough to handle toys made for larger species like the Macaw. Favorite toys include ropes, wooden blocks, acrylic balls, and bells. Generally, the Senegal is not overly particular about the foods it eats. 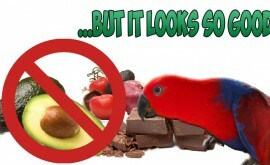 Along with a high quality parrot food, most healthy foods are accepted. For instance, this parrot loves fresh fruits and vegetables, cooked and cooled spaghetti, scrambled eggs, and so on. One important note is that the Senegal is prone to becoming overweight so proper diet is imperative along with exercise. Probably the biggest concern regarding the Senegal is Aspergillosis. This fungal disease is actually quite common among birds. For this reason, a clean cage, healthy diet, exercise, overall good care, and low or non-stress environment will reduce risk of this species becoming ill.
Based on popularity, finding a Senegal parrot to purchase is relatively easy. Along with having a good nature, this particular species is more affordable than larger sized parrots. Other parrots in the Piocephalus family with similar sizes and dispositions are the Red-bellied, Brown-Headed, Jardines, Cape and Myers parrots. All payments are safe and secure ! Return your item as it was shipped and get your money back, less shipping fees. Everything Birds Online Copyright © 2019.